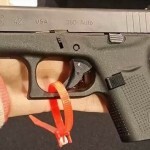 B&T has quietly been working on a .380 pistol. 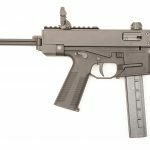 Maintaining much of the profile of the B&T TP9 and select-fire MP9, the new TP380 retains the grip ergonomics and TP9 type of folding stock mount of the TP9 series. Rather than using a protruding reciprocating knob such as a MAC or Uzi, the charging handle appears to be similar to the SITES Spectre series of weapons. 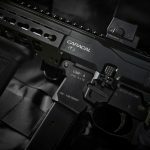 The optic rail is shorter to facilitate the top charging handle. Available in 15 or 30 round capacity, the magazines appear as smaller versions of the 9mm magazines. The front has a horizontal Picatinny mount for lights and lasers. The circle in the bolt allows the rim of a .380 Auto cartridge to be inserted in order to cycle the bolt back if it jams. 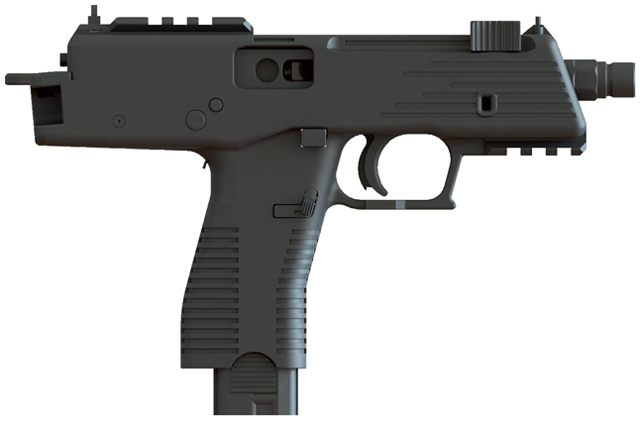 The small hole on the right side, forward of the trigger, is for locking the stock closed. Unlike the TP9 the TP380 loses the rotating bolt in favor of a closed blowback operation and does away with the AR15 influenced charging handle. 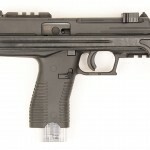 The safety selector is the same push-bar type seen on the TP9 series and Steyr AUG’s. 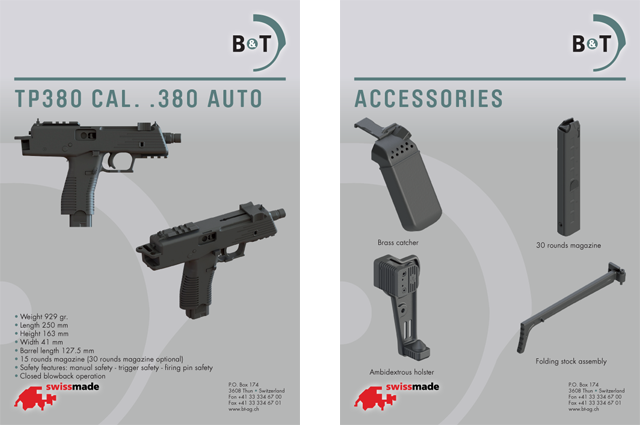 B&T USA is expected to be importing them when available. Because these aren’t in production yet – we do not have any known pricing, firearm photos, or release dates. Download the PDF flyer shown above. Thanks to some fantastic people we have the Swiss B&T ..